Join us on October 29 at West Island School or October 30 at Harrow School Hong Kong to gain training on developing mentally healthy schools, based on research and international best practice in youth mental health. *Sessions will be conducted in English. Translation to Chinese (Cantonese) will be available. *Cash payment available at the door, depending on ticket availability. Schools, teachers, parents, and students can often feel quite separate from one another when it comes to managing wellbeing and mental health. The whole-school approach allows these different stakeholders to feel connected with a cohesive strategy to help, which has staying power. Teresa will use case examples submitted from Hong Kong educators and students to illustrate how Charlie Waller Memorial Trust’s whole-school framework could be implemented in schools. Her proposals are based on extensive experience in the UK setting. Teresa will discuss how different staff can work together around wellbeing, how to increase student buy-in, and how parents and educators can work collectively to help with youth wellbeing in multiple contexts. 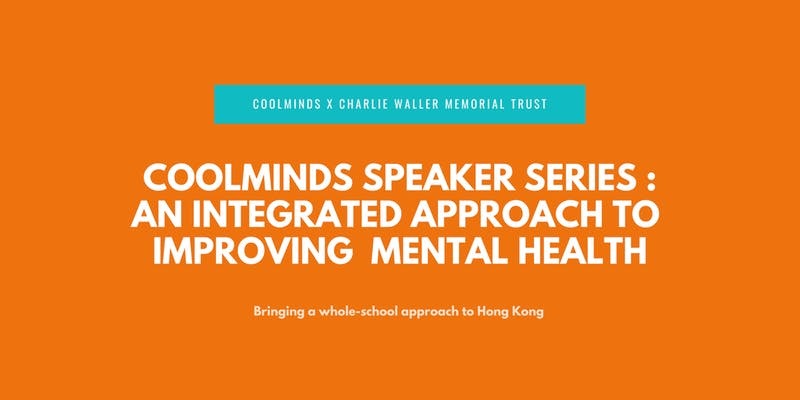 This talk will also discuss the evidence based ‘Five Ways to Wellbeing’, and ideas about how this could be operationalised effectively in Hong Kong schools. Charlie Waller Memorial Trust (CWMT) is one of the leading charitable organisations in the UK in raising awareness of mental health among young people. Their programme for schools and young people provides evidence-based presentations and training to schools that motivate, inform and provide practical ideas and tools that can be easily implemented. We are extremely grateful to CWMT for allowing Teresa Day, Director, Schools and Families Programmes to join us in Hong Kong for this event and share CWMT’s accumulated wisdom what a whole-school approach looks like and how schools in Hong Kong can integrate it into their systems. Teresa Day is the Director of Charlie Waller Memorial Trust’s Schools and Families programme, where she recently led a large project funded by HEE (Health Education England) on the mental health needs of vulnerable children. She has extensive experience in the public health and education field in writing, developing, and delivering mental health training to support whole school communities. She has a Master’s degree in nursing and has held posts in general and psychiatric nursing. Teresa is passionate in improving youth wellbeing using a whole school approach and promoting the voice of young people. This talk is suitable for all education professionals, including teachers, leadership and management, and wellbeing/psychological support staff in Hong Kong. We encourage parents (of children aged 11 and over), and pupils (aged 16 – 19) from the schools with attending staff to attend this event, in line with a whole-school approach. We would like to thank Aetna International for funding this project and Chi International for making CWMTs visit possible. We would like to extend our thanks to Harrow School for hosting this event. For more information on this event, please visit our Eventbrite page.